Music is something that makes you happy and relaxed. If you are in a sad, depressed, bored or angry mood, just sit down and listen to your favorite music and it makes you feel better. There is music to match each and every mood. Other than making you feel better, music is also able to treat various diseases. 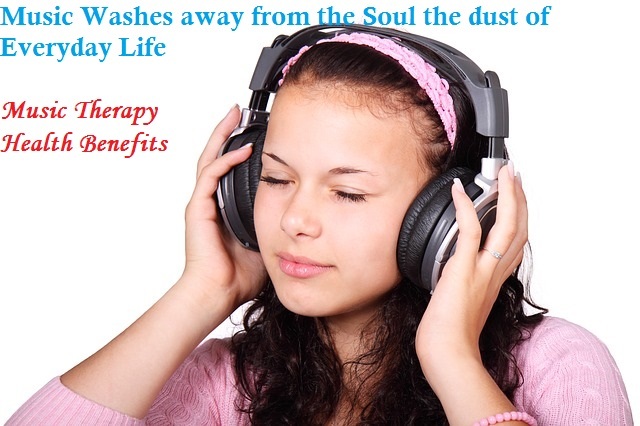 This method of healing is called Music Therapy. So, you may now have a painless and easy way to treat a number of health problems. What is music therapy and how it helps you to have good health? Music therapy is the method of healing diseases by listening to music. Patients suffering from serious diseases like cancer are found to react positively to music therapy. This method is found to be effective even in the case of kids having attention deficit disorder (ADD). Music therapy is now used in many of the hospitals and medical institutions to provide relief to depressed minds of the patients suffering from various diseases. It helps in quick recovery and also reduces pain. According to a therapist from a renowned university, music can cure patients suffering from cardiovascular problems. It is found to be effective with any type of music. When you are doing breathing exercises put on spiritual music or any other music that is smoothening. Breathe according to the rhythm of the music. This way you can de-stress yourself. If you are very tensed or too anxious that you start walking around the room from one corner to the other, listen to music. You can listen to Indian classical music, which is very smoothening and makes you calm and relaxed. You can also practice breathing exercise. Listening to good music removes all negative thoughts from your mind and fills you with positive energy. It elevates your mood and wipes away all depression. Rhythmic music is very beneficial for those suffering from depression and ADD. It will change brain waves and is good for them. ADD patients, who are overactive, can be relaxed by listening to music. If you are too angry or under great tension, put some soft music and it will sooth your mind. This helps in keeping the blood pressure stable and under control, making you relaxed. Other than your mental health, music therapy also proves your physical health. It makes your heart rate normal, improves the cardiovascular health, loosens up muscles, reduces chronic pain and also stimulates motor skills in ADD children. According to the studies made in Austria, it was found out that if you are suffering from chronic back pain, you get relief by listening to music. According to the studies made, music that have strong and vibrant beats helps in stimulating the brain waves, so that it also starts vibrating according to the beat of the music. This helps in increasing the concentration power. On the other hand, soft music is beneficial in making the disturbed mind calm. Listening to altering music beats lead to alterations in brainwaves also. This leads to changes in the body functions. Autonomic nervous system such heart beat and breathing, which control the brainwaves, are also affected by the music one hears. If you listen to slow and soft music, it will make breathing slow and keep the heart beat rate under control. As a result, your body and mind is relaxed and many of the problems that may occur due to chronic stress are prevented. Music also has a lot of other advantages. It lowers the blood pressure by making you feel relaxed. As a result, your risk to cerebral (stroke) and coronary attacks (heart attack), as well as many other health problems is greatly reduced. Music is also good for increasing your immunity towards various infections and diseases. It helps in reducing muscular pain also. Your gym and aerobic classes are always alive with loud music. This is put not only for the purpose of entertainment, but also to divert your attention from the exercise that you are doing. So, you do not get bored by doing the same exercise again and again. As a result, you will do your workouts with more energy and commitment and thus improve your health. Music therapy is very beneficial for children with different-needs. Children suffering from ADD, mental illness and those having physical disabilities, show great improvement when they listen to music regularly. If the child is suffering from ADD or ADHD, he/she may not be able to concentrate in his/her studies. Then the child may be allowed to start playing musical instruments and in this way the child’s concentration is increased. As a result, they can start following sounds and even words. Children who have problems with vision can also listen to music. This will increase their response to various types of sounds ant they can connect these sounds with objects that they cannot see. During labor, if you listen to soothing music, it will distract your attention from the pain and makes delivery less painful. Majority of the people suffer from back pains and pain at the lower back. It may happen in people of all age group. Listening to music is one of the most effective ways to reduce pain as it helps in releasing endorphins, which can reduce pain. When you get ready to sleep, listen to soothing music. This helps in calming down and relaxing your brain, providing you a sound sleep. Music therapy, especially classical music, helps in treating epilepsy also.